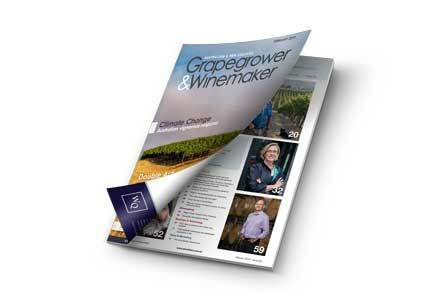 The February 2019 issue of the Grapegrower & Winemaker has a special focus on climate change. Our coverage kicks off with journalist Eleanor Danenberg’s chat with four growers from both warm and cool climates to find out how our changing climate is impacting their vineyards and what they are doing to adapt to these changes. Hans Mick reviews the findings of an elaborate Australian study which measured the combined effects of rising temperatures and carbon dioxide on vine growth, fruit production and wine quality. CO2. The El Niño-Southern Oscillation (ENSO) strongly influences the climate in Australia, as does the Indian Ocean Dipole – the difference in sea-surface temperatures between the western and eastern parts of the Indian Ocean. Researchers from the New South Wales Department of Primary Industries, Agriculture Victoria and the University of Melbourne reveal the conclusions of their investigations into whether these two climate drivers are affecting the timing of winegrape maturity. We also look into a study by the National Wine & Grape Centre to establish the optimal time to defoliate vines to minimise sunburn. Mark Smith looks at a state-of-the-art microclimate and prediction system being used at Pooley Wines in Tasmania to help it make better informed and more sustainable vineyard management decisions. And we learn about a nearly completed study into the impact of heatwaves on the composition of Shiraz. To see more about the February issue click here, and to subscribe to the Grapegrower & Winemaker click here.